like the sand on the sea beach. like thousands of fat lambs. because there is no disappointment for those who trust in you. don't cover us with shame. give glory to your name, Lord. " We have heard the first reading of today's liturgy. She was read in a new way this morning, knowing that today I would come here, among you. It always happens this way: listening to the Scriptures from the reality of today discloses and communicates further meanings, which are contained in it. The biblical page comes to fruition in our ears (see Lk 4,17-21) and reveals a further sense, which we had perhaps missed or which we did not understand well, and which is manifested to us today. This text contains the prayer of three young sons of Israel: Ananias, Azarias and Misaele, thrown into a large fiery furnace by the Babylonian king Nebuchadnezzar, because they refused to worship his golden statue. Their determined determination to be faithful to God and to preserve their freedom actually exposes them to martyrdom, as happens today also to your Christian peers, in some parts of the world. But God intervenes to prevent the flames from hurting the three young men: in front of the incredulous eyes of Nebuchadnezzar, Ananias, Azarias and Misaele walk in the fire as if in the furnace "a wind full of dew blew" (Dn 3, 50); they are accompanied by an angel - one who "in appearance is like a son of gods" (Dn 3,92) - and they begin to praise and pray to God. Today's Reading contains the penitential part of this prayer. According to many scholars, the date of composition of the book of Daniel is to be placed at the time of the persecution of the Seleucid king Antiochus Epiphanes, before his death in 164 BC Since the events of Daniel and his three young companions take place in the sixth century BC, during the exile in Babylon, we understand the logic of this biblical book: to courageously face the persecutions suffered in the present, Israel recalls the example of famous personalities of the past (Daniele, the three young people, the young Susanna in chap.13), who lived faithfulness to God and to his Torah. Memory always gives us strength: the memory of the past brings us not only a message, but brings us the strength of belonging to a people. Thus they have conquered with their testimony the destructive violence of the powers of this world: they have remained unharmed and have even obtained the confession of faith in God of their enemies (see Dn 3,95-96), realizing the priestly mission of Israel in the midst of the people and of universal blessing for all peoples. Being wrapped in flames and remaining unharmed: it can be done with the help of the Lord Jesus, the Son of God, and the breeze of the Holy Spirit. I imagine you this way: even if we live in a cultural context marked by the unique thought, which wraps and puts everyone to sleep with his deadly embrace and burns all forms of creativity and divergent thought, you walk unharmed thanks to the rooting in Jesus and his Gospel, made actual by the power of the Holy Spirit. In this way you keep a high eye and also a different look at reality, a Christian difference that brings newness. The academic path you are taking in this Pontifical University aims not to isolate you from this context, but rather to inhabit it with critical awareness and capacity for discernment, in view of that action in which your contribution to the cultural and social life of the world is expressed . Adherence to the Gospel and the acceptance of the rich heritage of the ecclesial tradition, at all levels, do not aim to block thought, nor do they ask us to wearily repeat the usual formulas: they want first of all to give you a free, authentic point of view , true to reality, I would say "healthy", compared to our time. We want to remember the roots, which are different from the tree: they are underground, but they are the roots. And this passage wants to remember, in the persecution of Antiochus Epiphanes, the roots of a people, the memory of a people. The memory that is like the sap that comes from the roots and makes the tree grow and flourish. Think of the push we are continually receiving to live in a comfortable and stingy individualism - all of us - concerned only with our own well-being, our free time and self-fulfillment ... I stop to touch a point that hurts me: our demographic winter. "But why don't you have a son, at least, or two?" - "No, but I think, I'd like to take a trip, I'm still waiting ...". And so couples go on without fertility. For selfishness, for having more, even for cultural journeys, but children do not come. That tree does not bear fruit. The demographic winter that we all suffer today is the effect of this unique, selfish thought, directed only at oneself, which only seeks "my" realization. You students think well about this: think about how this unique thought is so "wild" ... It seems very cultural but it is "wild", because it prevents you from making history, leaving a story behind you. How dangerous all this is, how much it separates us from others and therefore from reality, how much it makes us sick and delirious! The many neuroses ... It often quickly turns into an exaltation of one's personal "I" or of the group, in contempt and deviation from others, from the poor, in refusal to let oneself be challenged by the evident ruin of creation! This is a shame! To be taken by the hand by the Lord, by the angels that He sends us, to follow the Spirit that is like the wind and whose voice we recognize today, means to avoid being burned: burned in the brain, in the heart, in the body, in relationships , in everything that sets life in motion and fills it with hope. It is from the contemplation of the very mystery of the Trinity of God, and of the incarnation of the Son, that the primacy given to the relationship, to the encounter with the sacred mystery of the other, to communion flows for Christian thought and for the action of the Church. universal with the whole of humanity as everyone's vocation. Veritatis gaudium states that the priority and permanent criterion for the renewal of ecclesiastical studies "is that of contemplation and spiritual, intellectual and existential introduction into the heart of the kerygma, and that is the ever new and fascinating news of the Gospel of Jesus". In fact, "from this vital and joyful concentration on the face of God revealed in Jesus Christ" descends "to live as the Church" the mysticism of us "which becomes the leaven of universal brotherhood", descends "the imperative to listen in the heart and to do the cry of the poor and of the earth resound in the mind "and" to discover in all of creation the trinitarian imprint that makes the cosmos in which we live a web of relationships, propitiating a spirituality of global solidarity that springs from the mystery of the Trinity "(n . 4). The mystique of "we". Once, a young priest made me a trap and told me: "Tell me, father, what is the opposite of" I "?". And immediately I replied: "You". "No, Father, even the Popes are wrong, no. The opposite of "I" is "we". We. It is that which saves us from individualism, both from the self and from the "you". Understand well that the Gospel gives us the most radical and profound antidotes for defending ourselves and recovering from the disease of individualism. There is another passage in this biblical passage, which I would like to talk about. In their humble request for forgiveness, the three young people recognize that God was righteous in his judgments and in his works. He let Israel experience the disastrous consequences of being away from the Lord, and instead of becoming "as numerous as the stars of the sky and the sand of the sea", he became "smaller than any other nation", divided and partly forced into exile . Here I resume what I said about the demographic winter. In their prayer the three young people interpret the history of the people. Despite being the last link in the chain of generations of Israel, they feel nothing other than the people and its history. They feel the weight of an open account with the Lord and intone a beautiful prayer which is a recognition of guilt and a request for forgiveness. Faults are fathers, we pay the consequences, yet at this moment we ask forgiveness on behalf of all. No distancing, but recognition that the mistakes of the fathers can be repeated, be updated, even by today's generation. There is a solidarity in sin, which becomes solidarity in the confession of faith: God who is infinite mercy will have mercy on the fathers and also on us. This painful prayer of the young is beautiful! In the first place there is thanksgiving for God's faithfulness: "Blessed are you, Lord God of our fathers" (Dn 3,26). The fathers testify that God was just, but he did not abandon us to ruin, rather he was faithful to the promises made to his friends: Abraham, Isaac, Jacob. 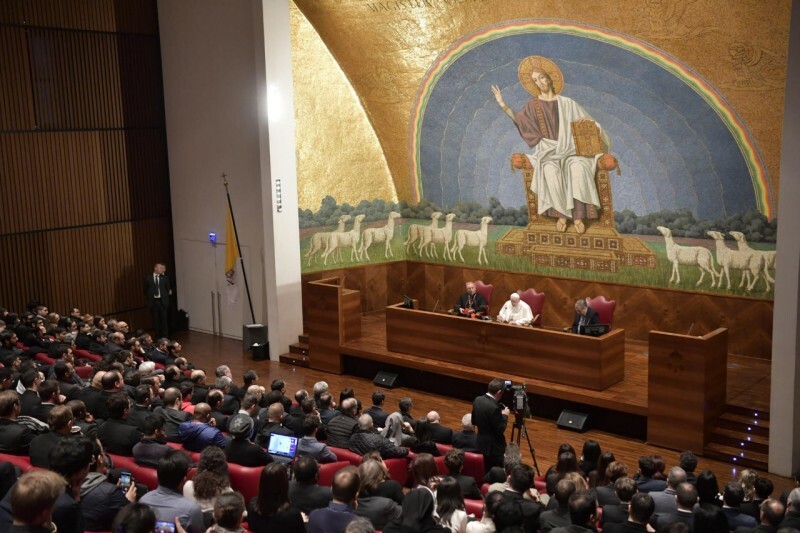 Young people believe in this testimony of the fathers, they commemorate the history of the people always marked by God's mercy, and open themselves to the future. They are convinced that there is a future, there will be, that the door is not barred, even in the midst of hostility and persecution. And this is because God is always faithful and always forgiving. Always. God never tires of forgiving. I would like so much that you guard this hope founded on the promise of God. I would like so much that in planning the future you kept the memory of being a people, of having a story with lights and shadows, of being protagonists in the today of that dialogue of love between God and the men that has crossed the centuries! Fathers' dreams will fuel and provoke your visions for today. The feeling of being part of a people of sinners will give you the antibodies to avoid making the same mistakes: towards God, towards others, towards the whole creation. The studies you do in this University will be fruitful and useful only to the extent that they will not release you from this conscious belonging to the history of the people and of humanity as a whole, but they will help you to interpret it with the keys of interpretation that emerge from the Word of God opening up to a future full of hope. I know that one can study closing up in academic circles without breath, playing with concepts instead of interpreting life, clinging to formulas but detaching oneself from the real existence of people. For this reason I hoped that in ecclesiastical studies a "radical paradigm shift" will be realized, a "courageous cultural revolution" that, arising from the contribution of the reflection and practice of the people of God "in the field" of all corners of the world, will produce "A true evangelical hermeneutics, to better understand life, the world, men". We have not yet overcome the logic of the Enlightenment, we have not overcome it. This is the challenge: the new hermeneutics that goes in this direction. The hermeneutics of memory, of belonging to a people, of having a story; the hermeneutic of walking towards a hope, hermeneutics - I repeat one thing that I like to say - of the three languages, together, harmonics: the language of the mind, the language of the heart, the language of the hands, so that we think what we feel and do; one feels what one thinks and does; you do what you feel and think. This hermeneutics is needed today to overcome the legacy of the Enlightenment. There is no need so much for a new synthesis but "for a spiritual atmosphere of research and certainty based on the truths of reason and faith", which will be fruitful "only if it is done with an open mind and kneeling": both what's this. In fact, for example, the theologian who welcomes his complete and concluded thought, what is it? A mediocre theologian. The good theologian, the good philosopher has an open, that is, incomplete, thought. Fall in love with incomplete thought, because this is our path, always open to the maius of God and to the truth (see Apostolic Constitution Veritatis gaudium, 3). With this spirit and this discipline, the studies you do here will help you to interpret the world and build the future together with the Lord, well founded in belonging to the holy people of God, whom He guides with love, inspires, nourishes and corrects with the his Word. And a last reflection starting from the passage from the book of Daniel. There have been seasons of history in which Israel has had neither princes (that is, shepherds who led it on behalf of God), nor temple (the firm rock of the presence of the Glory of God among the people). In those moments, however, God sent prophets, so that the people would not be deprived of his Word and his guidance. Instead Azaria points out that now, in the Babylonian exile, there are no longer even those! There are no prophets. What remains to be done? Nothing but to present oneself to God with a contrite heart and humiliated spirit, whom God will like "as holocausts of rams and bulls, like thousands of fat lambs. Let our sacrifice be before you today "(3: 39-40). This passage of prayer is beautiful. I see a bit of youthful boldness, a presentation before God with his own naked shame. And you young people, please: present yourself before God with your naked shame. It will do you good. Not just you, all of us. A bit like when you "pull the rope" of the patience of parents and grandparents, knowing that you are very loved. But here the intuition of the three young people saw right: nothing moves the mercy of God like our truly contrite and humiliated heart. This is a great thing. Indeed, the younger son of the parable of the merciful Father, an expert on this youthful impudence, knows that he will be received even if his repentance is not exactly as it should be. "I will get up and go to my father." Behind all this there is a trust, a faith: "there is no disappointment for those who trust in you" (3.40). I wish you to be so open to the future, enterprising and courageous in dreaming and planning it, with the help of the studies you do, because "brazenly" confident that there is no disappointment for those who rely on the Lord. I greet you all, I wish you a good Lenten journey. May the Lord fill your face with his light and make it as beautiful as the face of the three young men of the book of Daniel was for fidelity to the Word of God (1,14). I greet and thank the Rector Vincenzo Buonomo and the body of professors of the Lateran University: they are the fathers who testify to the faithfulness of God despite sin, and the dream masters for the future. There was also a bit of cheekiness in the attitude of a Pope who comes in through the door, not even saying "good morning", and he begins to preach. Now I can say: good morning! The sermon is done. That rude Pope now apologizes: it was a liturgical moment that began with the Word of God, read by the Rector, and then the sermon. Now I want to thank you, all of you, for this welcome. I wanted to come to the University and wanted to talk to you like that. And Lent was the occasion to do it. I thank you for listening - I have not seen anyone who has fallen asleep, at least you are polite, thank you! And keep working, because life doesn't start with you but needs you to continue. Rooted in the memory of ancestors, rooted in belonging to a people. The present is yours and not yours: it is a gift that comes from history, offered to you, but to carry it forward. Your decision is one that will ensure that that gift continues to go on and bear fruit. Thank you! Pray for me, because - as they say in Argentina - sometimes it is up to me to "dance with the ugliest"! The Lord wanted them too to have the right to dance! So let's go ahead, and let's get on together. Pray for me, I will pray for you. Do not lose your youth, do not lose your sense of humor, do not miss it! Seeing a bitter young man is very ugly. The sense of humor is, on the human level, the attitude closest to the grace of God. Do not lose the sense of humor. Thank you very much! Pray for me and good Lent, and goodbye. Now let's go back to the liturgy: let us pray the Our Father together. "Our father…"